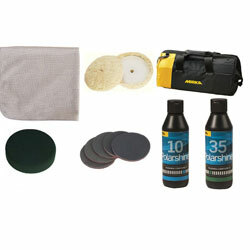 Mirka Marine Gelcoat Refinishing Kit, is designed for removal of light scratches and oxidation from gelcoat finishes when oxidation and minor scratches are your problems and rubbing compound isn't doing the job. Try a test patch, if after washing the rubbed area, the oxidation is still visible, its time to wet-sand and re-polish the hull. You must have enough gelcoat to sand.